PCTCs are distinctive ships with a box-like superstructure running the entire length and breadth of the hull. The image below is a digital mock-up of one of our 6,700 CEU vessels. 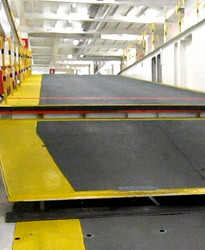 This is the main ramp for (un)loading. It is strengthened for ‘high & heavy’ cargoes like industrial/ agricultural equipment and rolling/project cargoes like windmill blades loaded on trailers. 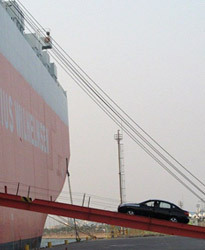 The side ramp allows dual loading and discharging in major ports where thousands of cars are (un)loaded in a short time span or the separation of cars and ‘high & heavy’ cargo flows. 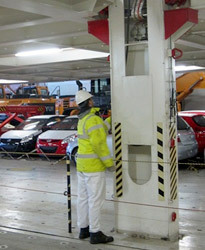 The ramp control room is positioned to provide a clear view on the quayside. From here one crew member can control the lowering and raising of the quarter ramp. 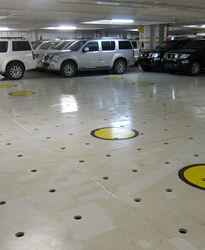 These decks are used for passenger vehicles and flatter cargoes, and are designed with few obstructions. Below hoistable decks, these are strengthened for carrying heavy cargo. 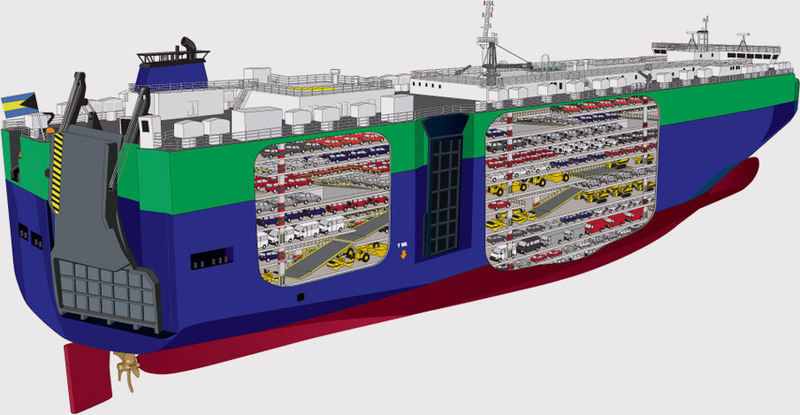 Unlike Pure Car Carriers (PCC), Pure Car and Truck Carriers (PCTC) are equipped with a number of hoistable decks. 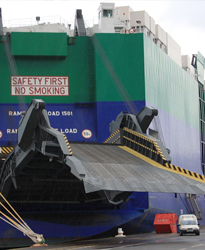 This allows loading of high cargo such as trucks, construction and mining equipment and even small yachts. 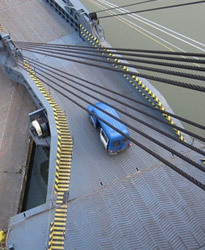 The internal ramps provide access for cars between the car decks. Good positioning is important for optimal cargo flows and they are also fitted for storing cargo. 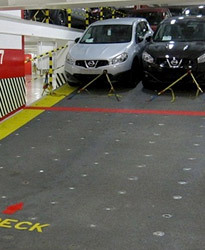 These are fitted to move cargo regardless of deck height and can serve as a car decks when raised to the level of the surrounding panels. 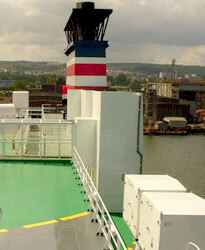 PCTC vessels require an advanced ventilation system to manage vehicle exhaust during (un)loading. A PCTC vessel is typically equipped with a compact low-speed two-stroke main engine. 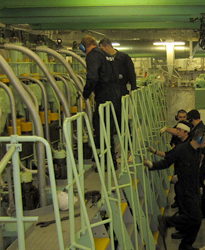 Engine room design is also important, ensuring good accessibility and sufficient work areas. 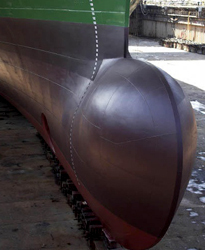 A bulbous bow is a protruding bulb at the front of a ship just below the waterline. It modifies the way the water flows around the hull, reducing drag and thus increasing fuel efficiency, range, speed and stability. 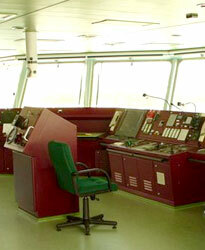 Different from many cargo ships, the bridge is positioned at the front of the ship. Crews are often at sea for several months or more. 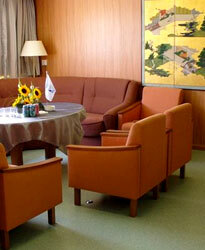 A spacious and comfortable accommodation provides a good quality of life aboard.